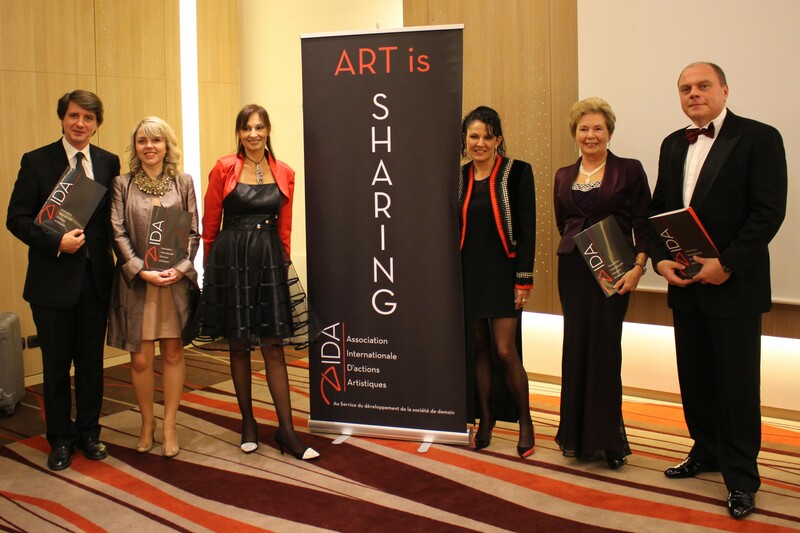 A new art association has been born in the Principality and its name is AIDA (in English International Association of Artistic Actions), founded by former Minister of Culture and Tourism of Ukraine Mykhailo Kulyniak, and Monegasque fashion photographer Calypso de Sigaldi, with artistic projects that will tour the world. The announcement was made on October 20, 2015 at the Novotel Monte-Carlo, during a Press Conference followed by a private cocktail and photo-exhibition entitled “Fashion Pages” in honor of Rene Gruau (1909-2004), exposing photos by the famous French-Italian painter and illustrator and his many collaborations with fashion designers of his time, along those by Calypso de Sigaldi. This ephemerous exhibition will run through October 28, 2015. H.E. Ambassador Henri Fissore and Didier Viltart from the Opera Art Gallery in Monaco were among the distinguished guests. AIDA’s mission is to demonstrate that art is a necessary agent of exchange and understanding of others amid different communities and among generations. Their goal is to build an international community of people wishing to be involved in artistic projects of a cultural value that aid to the evolution of our society. Their program is very ambitious and will start in 2016 with a European tour of the sumptuous exposition of the great American photographer Steven Lyon entitled “LyonheartLove” where this photographer, originated from the world of Fashion, left the comfort of his New York study to go to the encounter of the Big Five, the five great animals of Africa, to alert the public opinion about their future. This is a project that mixes art and ecology. The exhibition will be accompanied by the projection of the documentary film “Something that Matters“, that is currently in the planning process. Another of their upcoming projects, that is at the heart of AIDA’s President Mykhailo Kulyniak, will be to the celebration of the centenary of the birth of Yehudi Menuhin through a tour of exceptional concerts, that will take AIDA to Carnegie Hall in New York. The Board of Directors of AIDA is composed by: Mykhailo Kulyniak, President, who will be in charge of all the international Relations of the association; Calypso de Sigaldi, Vice President, and mainly in charge of energizing the life of the association in Monaco, proposes to supervise the projects in the francophone countries and structure communication; and Jeanne Kostenko, Treasurer, who will ensure the financial health of the association. The Board of Directors of AIDA is wisely complemented by foreign representatives: Dmytro Sukhovienko, renowned pianist and Artistic Director, notable concerts presented at the European Parliament in Brussels, who accepted to occupy the position of Musical Advior of AIDA, representing the association in Benelux; Alexander Bazhenov, Orchestra Conductor and internationally known violinist will be the representative in Germany; Lessia Oliinyk, Doctor in Philosophy and History, VP of the Tchaikovsky National Music Academy in Ukraine, and member of the Ukraine national committee of UNESCO, will be the representative of AIDA in her country; Oxana Melchynuk, used to manage cultural projects at the international level, with her invaluable experience in functions she used to have at the Cultural Ministry in Ukraine, as well as her vast knowledge of the artistic domain throughout Europe, will be Artistic Advisor particularly for all the association’s projects par rapport with Slavic art. As the association evolves they will build an even larger network of agents around the world to assist them to make travel and promote their many projects.